Stems: Scapes, erect, from rhizomes. Leaves: Leaves aboveground absent, leaf-like structures (actually bracts) whorled, 3. Bracts sessile, blade dark green, obscurely marked with few to many darker blotches or unmottled, broadly ovate to round, 3.5 to 5.5 inches long, 2.75 to 3.5 inches wide, apex broadly rounded or obscurely cuspidate. Flowers: Sepals 3, green, sometimes tinged brown or purple, spreading, lanceolate, 1.5 to 2.5 inches long, .2 to .5 inch wide, apex acute; petals 3, ascending or erect, brownish purple or purple proximally, yellowish green or green distally, sometimes all dark purple, elliptic to narrowly spatulate, 1.5 to 3.2 inches long, .3 to .5 inch wide; stamens 6, distinct, free, one-quarter to one-third as long as petals; anthers .6 to .8 inch; pistil 1; style 1. Fruits: Fruits berries, dark purplish green or green, ovoid; seeds several per locule. 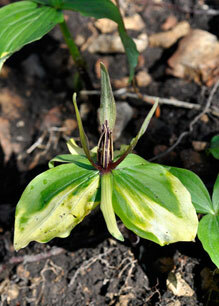 Distribution: Trillium viridescens is known only from Cherokee County. Comments: Trillium, 3 + Lilium, alluding the flower parts in threes and viridescens, becoming green, alluding to the sepals. Trilliums produce no true aerial stems or leaves. Scale-like leaves are produced only on the rhizomes. The stem-like structure that bears the flowers technically is a scape, and the leaf-like structures subtending the flowers are bracts that have taken on the functions of leaves.